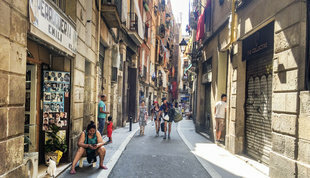 The Raval neighbourhood in Barcelona. Arxiu. How to avoid the OPERA, the fist prehistoric serial killer an other stories Arxiu. Teresa Solana’s crime novels are fast-moving satires that pinpoint, often by exaggeration, Catalan society. She is rare among crime writers, who by definition deal in unfunny murder and theft, in that she uses comedy, approaching a nasty and very real reality slightly askew. This book is a great introduction to Solana’s writing. It comprises eight linked stories from her 2017 volume Matèria grisa and five from an earlier collection, Set casos de sang i fetge i una història d’amor (Seven cases of Blood and Guts and a Love Story). You can see in the titles her zest for words. Here are three examples from the latter title, to give a flavour of her flair. Still Life No. 41 is a first-person narrative (like most of the stories), told in a colloquial tone. The narrator is justifying herself after an unfortunate disaster in the art exhibition she is curating. So accustomed to getting her own way, she uses a string of clichés and condemns herself out of her own self-righteous mouth. Solana nails the lack of awareness of the privileged upper-class. Another story, Happy Families, portrays a family of snobbish ghosts, determined to hang on to their privileges in a haunted house. I’m a Vampire is also supernatural. Ghosts and vampires, it transpires, are just as stupid as humans. The vampire, despite being nine hundred years old, is absurdly literal, understands nothing and thinks that graffiti against a local exploiter, “You’re a Vampire” sprayed on the walls in red paint, refer to a rival vampire. Solana is skilled in using a narrator who is ignorant of his/her ignorance. What kind of humour is Solana’s? First it is in the language, very clear and rhythmic with a lively use of slang. And second, it is brutal and direct. A person deals with a grotesque, extreme or ridiculous situation in a matter-of-fact way, whether a prehistoric detective finding out where babies come from, a rich girl murdering relatives to avoid going to the opera or two old ladies, in a brilliantly macabre response to sexual violence, cutting up a corpse (with an even nastier twist that can’t be given away). Very violent situations are made curiously downbeat and normal. The playfully connected stories from Matèria gris in the second half of the book, mostly set in Barcelona, are not at all supernatural, though quite surreal. Their characters are (fairly) normal people put into unusual situations. A young woman witnesses a shooting and is kept for questioning in the police station when all she wants to do is go to the Beyoncé concert. An impoverished elderly woman lets out her flat to foreigners: “When you’ve got strangers in your house, you never know what might happen.” A diplomat plans to murder his intolerable wife. A man finds a corpse in his garden. Like several of the stories, these two have ferocious twists at the end. Solana’s stories (title story excepted!) are very up-to-date: Brexit is mentioned and the impact of the economic crisis on ordinary lives is ever-present. Her characters are not detectives or professional crooks (though Chinese and Russian gangsters do appear), but ordinary people placed in situations where they end up doing something illegal or having something illegal done to them. Emphasising the effects of the crisis, Solana said in an interview that we live in “a corrupt environment in which honourable behaviour is almost impossible.” However, as she underlines, there is a vast difference between the politician or businessperson swindling millions and someone struggling to reach the end of the month. Teresa Solana writes with sparkling clarity and wit. Her stories move fast and keep you guessing: in one line they can shift from laughter to murder. Read the stories in The First Prehistoric Serial Killer and let them lead you on to her novels. 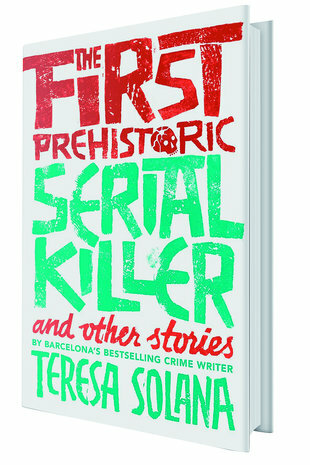 THE FIRST PREHISTORIC SERIAL KILLER and other stories Author: Teresa Solana Translator: Peter Bush Pages: 206 Publisher: Bitter Lemon Press (2018) “Her books are superbly plotted, as well as being sharp and acerbically funny commentaries on a society still coming to terms with Franco’s dictatorship,” Paul Preston. Teresa Solana comes to mind most days. In one of her novels, the entire shower and its soapy, wet occupant fall through the floor into the downstairs bathroom. Construction standards in Barcelona are not what they were. Each time I step into the shower, I think of this possibility and cling tight to the rail. Born in Barcelona in 1962, Teresa Solana has published seven novels and two volumes of short stories and has won three prizes. She started publishing relatively late. Previously, she worked as a translator and became head of Spain’s Casa del Traductor (Centre for Literary Translation) at Tarazona, in the province of Zaragoza, between 1998 and 2004. Her first novel, Un crim imperfecte (2006), A Not so Perfect Crime in English, is one of four to date featuring twin brother detectives, Borja and Eduard. These novels border on farce, but it is farce well founded on realistic characters, though with their features and behaviour tweaked up a touch. Solana has another more realistic series featuring Inspector Norma Forrester, starting with Negres tempestes in 2010 and followed by La casa de les papallones (2014). In them, Solana’s social critique comes into sharper focus: they are less anarchic than the books with the twins. Many of the best contemporary noir books are critical of society. As the late Paco Camarasa, curator of the huge BCNegra crime novel festival from 2005 to 2017, put it: “The crisis has drawn masses of readers to crime novels because of their clear critical character.” Teresa Solana is one of those noir writers who use the genre to denounce the injustices of capitalism. And, unusually for a crime novelist, she does so with humour.